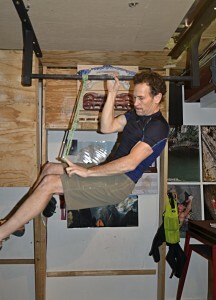 There is no more basic piece of training-for-climbing home gym equipment than a pull-up bar. 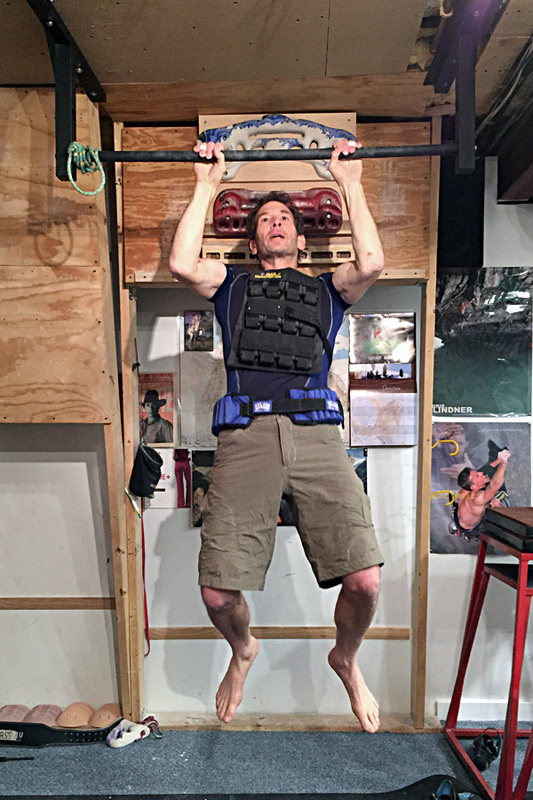 Regardless of whether or not you have a home wall, hangboard, or campus board, installing a sturdy pull-up bar in your home gym opens the door to a wide range of supplemental strength and endurance exercises. For years I searched for a simple, easy-to-install, and bombproof pull-up bar to add to my home gym (all the while singing U2’s “I still haven’t found what I’m looking for”), until last year I finally found it: The Stud Bar! At a price of just $140, the solid steel Stud Bar is a real deal considering that a simple plastic hangboard can easily set you back $100 – $150. The Stud Bar is 4-feet wide and comes in three different sizes, to accommodate different ceiling heights. I’ve got the 14-inch unit, which works perfectly given my basement ceiling height of 8’6″ (see photos below). While I won’t get into exercise details (follow T4C and you’ll learn many great pull-up bar exercises), I will list a few of the exercises that we regularly do on The Stud Bar: regular pull-ups (as a pre-climbing warm-up), weighted pull-ups (10 to 70+ pounds added), uneven-grip pull-ups, Frenchies, Typewriters, one-arm pull-ups….as well as a variety of core exercises, such as Windshield Wipers, knee lifts, and front levers. 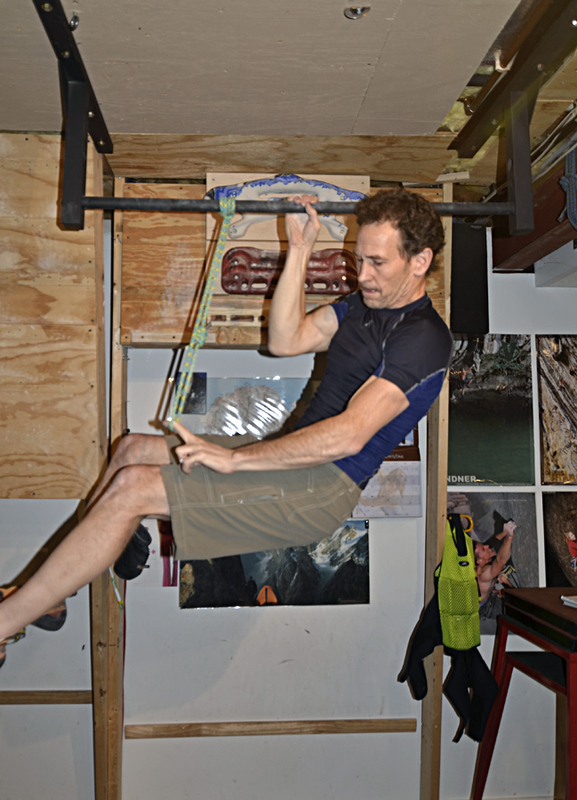 Sure, we also employ several different hangboards and a campus board for finger training, but a simple pull-up bar is the absolute best platform to perform the exercises described above. To purchase or learn more about The Stud Bar, visit www.StudBarPullUp.com. 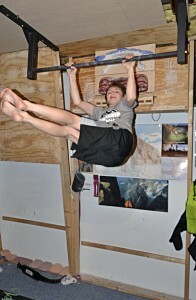 Uneven-Grip Pull-up….to train one-arm and lockoff strength. 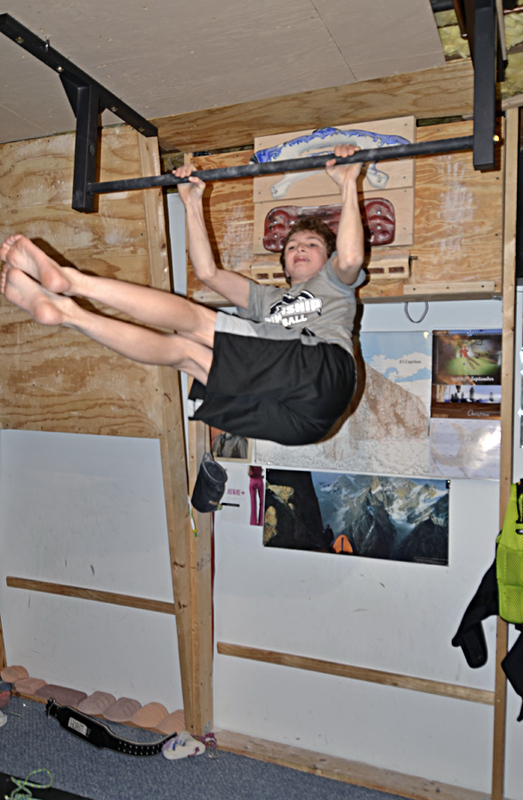 Hypergravity (weighted) Pull-up…to train maximum strength and power. Here I’m wearing 76 pounds via weight vest & belt. Windshield Wipers…a most excellent total core exercise! Here’s a photo of The Stud Bar “large” configuration (for ceilings over 10 feet high)–with the bar 39″ below the ceiling, you’ll be able to do muscles-up and kipping pull-ups.